I had the opportunity to watch, The Curious Savage, a spectacular play about a widow named Mrs. Savage who is sent to a sanatorium called The Cloisters. 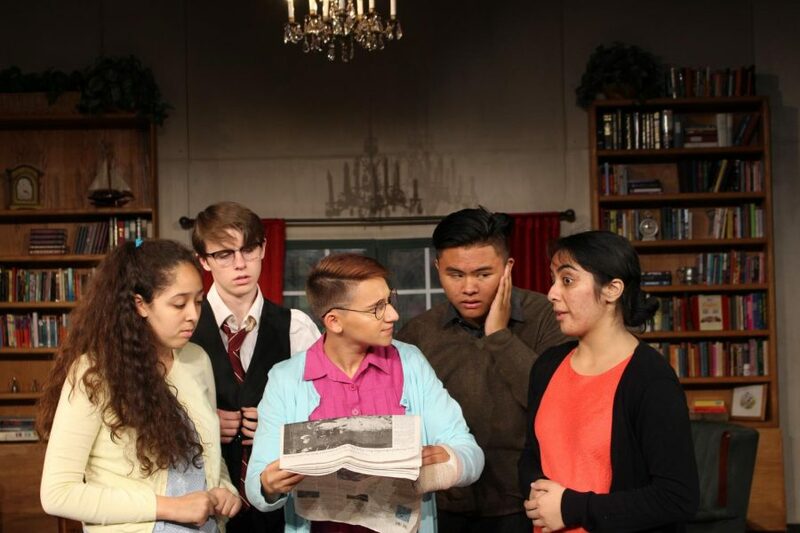 “It’s a wonderful combination of humor and mystery and heart-warming sentimentality that it’s just a good message about trying to live your life to its fullest and not letting dreams go unfulfilled,” said Ms. Christine Welk, the director of The Curious Savage and drama teacher of West High School. I agree with Welk. The Curious Savage beautifully combines humor and mystery in a way that keeps you wanting more. Mrs. Savage (played by Senior Sherien Maroufkhani) is a woman in her 60’s. Her husband died, leaving her with three step-children named Titus, Samuel and Lily Belle. Mrs. Savage married at the young age of 16, immediately giving up her dreams. Throughout the play she has a stuffed bear that she carries around. Florence (played by sophomore Isabella Ortega) is, in short, the mother hen. She lost her son at a young age, so to cope with the loss, she carries around a doll named John Thomas that she treats as her son. “She’s very kind-hearted and is always worrying about others and very motherly like due to her having a child,” said Ortega. Jeffrey (played by sophomore Jermaine Dela Cruz) is a handsome 25-year-old man who was in the war. During the war, his plane was shot down in flames; he hasn’t recovered. Mrs. Savage then asks Hannibal if “his face was badly burned,” to which Hannibal replies, “Oh, not at all. Jeff bailed out. But he was the only one. He lost his crew. His scar goes deeper than we can see.” Jeffrey believes that his face is marred by a scar on his left cheek which is always covered with his left hand. The audience later finds out that Jeffrey is a professional pianist. He made his debut a year before he was drafted in the war. Fairy May (played by sophomore Brinley Ras) is a compulsive liar who wants everyone to love her. “Say you love me” is what she says when she introduces herself. During the play, she wears dresses that she makes herself. Hannibal (played by sophomore Tynen Jensen) is a statistician who was replaced by a calculator. Not being able to handle it, he was sent to The Cloisters. Mrs. Paddy (played by senior Hailey Burton) is my favorite character. One day, her husband told her to shut up, and so she did for twenty years, “She gave up conversation for life.” Even though Mrs. Paddy doesn’t talk a lot, she does list off everything she hates ranging from cold cream to electricity to thunder. One of the things that she does enjoy is painting seascapes, even if she has never seen one. Lily Belle (played by freshman Allison Jenson) is Mrs. Savage’s step-daughter. She’s been married six times, once to an Islamic Prince. Titus Savage (played by senior Joseph Castelluccio) is one of Mrs. Savage’s step-sons. He is a nicely dressed business man. Last but not least is Samuel Savage (senior Joe Cardoza), a judge constantly in the shadows of his siblings. Miss Willie (played by junior Krislyn Wolfe) is the nurse at The Cloisters. Her husband is Jeffrey, but Jeffrey doesn’t remember her, only that he has a wife. So, to stay close to Jeffrey, she began to work at The Cloisters. Dr. Emmet is the doctor who takes good care of his patients, treating them with care and respect. Now that you’ve met the characters, you might think that this a semi-dark plot. Trust me, it’s not. As previously said, this play has a lot of humor. Mrs. Savage’s life was spent for her husband, and now that he’s dead, she wants other people to be able to live their dreams, no matter how small. “I decided I’d help others have the foolish things they’d always wanted.” This started the Jonathon Savage Memorial Fund or the Happiness Fund. In a desperate attempt to stop Mrs. Savage from continuing this, her three children send her to The Cloisters. In a great act of revenge, Mrs. Savage sells everything in her name, turning them into “nice half-million-dollar negotiable bonds that can’t be traced.” To give you a better idea, Mrs. Savage sold fifteen Savage industries and the stock in Savage Brass, getting ten million dollars (over 100 hundred million today). Since the step-children have lost basically all of their money, they try to get Mrs. Savage to tell them where she hid the money. The climax of the show had me on my tiptoes. (Warning: Spoiler Alert) The step-children had it up to their necks with Mrs. Savage’s antics. In a final attempt to get Mrs. Savage to tell them where the bonds are, Mrs. Savage grabbed her stuffed bear and rips open the back. She then reached in and pulled out the bonds. The lights went out, and when they came back on, the bonds were gone. After accusations from the step-children, Miss Willy finds what’s left of the money: ashes. After the step-children left—poor of course— Miss Willy revealed to Mrs. Savage that she took the money when the lights went out. It was Miss Willy who burned newspapers instead. With the money, Mrs. Savage can leave The Cloisters, but she finds that she doesn’t want to. Convinced by Dr. Emmet, however, Mrs. Savage goes to continue the Memorial Fund. Before she leaves, Mrs. Savage receives presents from everyone: a The Cloisters Saltshaker, The Cloisters cloth napkin, an eye for her bear, a kiss on the cheek from John Thomas, a book and a song from Hannibal. Mrs. Savage goes through the door. We see everyone else living their lives in The Cloisters, getting better. Finally, the actors all go on stage for a powerful moment. Jeffrey holds hands with Miss Willy, Florence is with her son, Fairy May is wearing a beautiful dress and Hannibal, Dr. Emmet, Titus, Samuel, Lily Belle and Mrs. Savage go onto the stage. With a final bow and a happy ending, the play ends. Overall, The Curious Savage is an empowering play about how being unique is the routine. If I could watch it one more time, I would.